To shred, or not to shred – now that is the real question. Whether ’tis nobler in the mind to suffer the slings and arrows of an examiner who finds you shred too soon, or to take arms against a sea of records that threaten to swallow you. 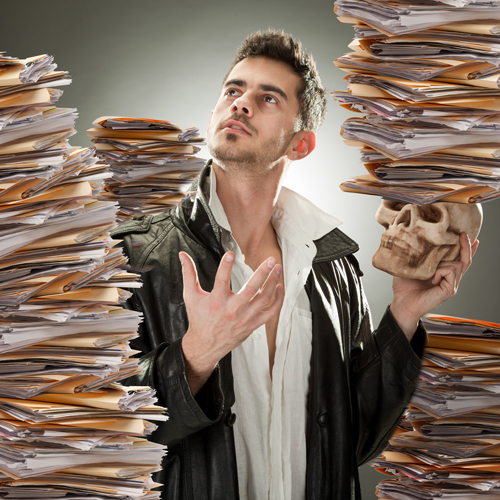 Relatively speaking, when it comes tough decisions, Hamlet had it easy compared to today’s compliance officer, who has to decide which records to keep and which to destroy and when. Complicating matters is the fact that relatively few regulations that result in the creation of records include hard and fast record retention requirements for those very same records. For example, the Fair Housing Act requires financial institutions to place the fair housing logo on all their mortgage related advertising, but does not specify a period of time those records are to be kept. In fact, the FHA doesn’t require financial institutions to keep copies of advertising at all. Of course, to determine whether you are complying with the FHA, examiners may ask for your advertising during their examinations and will likely not be amused if you don’t have it available for them. Thus, best practices suggest holding advertising for one examination cycle and then discard. That, my friend, is a guideline. Then there are regulations like Regulation B, the Equal Opportunity Credit Act (ECOA), which requires that adverse action notices must be kept for 25 months exactly. That, my friend, is a law. And if you’re in charge of managing records at your financial institution, don’t think that the best way to cover all your bases is to simply keep everything forever. While this may seem like a good idea, in addition to the costs of unnecessary record storage, such a practice can actually backfire as it could be determined the practice has unnecessarily increased your risk exposure by keeping sensitive data that could be lost or stolen. The best way to manage record retention is to create a sound record retention policy. Your record retention policy should take into account both federal and state record retention requirements. Sometimes, a state regulation may require you to keep a record longer than a federal regulation or vice versa. When this happens, use the longer of the two. Also keep litigation in mind. If your institution is going through litigation, or if you expect litigation might occur, you’ll have to place a litigation hold on all records. This would mean that you’d keep all your records, even if it was time to get rid of some, until the litigation was over. Alas, poor Yorick, when it comes to record retention, neither a tragedy nor a comedy be. Create and follow a sound record retention policy to help your financial institution live happily ever after. 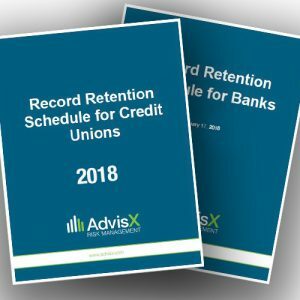 AffirmX’s sister company, AdvisX, has developed a Record Retention Schedule for credit unions and another for banks. To get a copy of this record retention schedule, normally $99, at no charge*, simply schedule a 30-minute call with one of our client liaisons to share with us what compliance or other risk areas are pain points for you. Then let us see if we have any solutions we can offer to help make those pain points go away in a cost-effective way (it’s what we do!). *Free record retention available to financial institutions only.